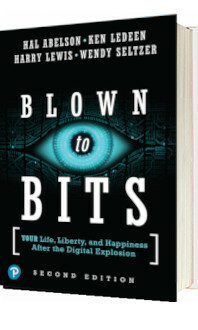 Blown to Bits: Your Life, Liberty, and Happiness After the Digital Explosion (Abelson, Ledeen, and Lewis) examines the impact of the digital revolution on modern society. In its eight chapters it examines issues ranging from digital privacy to encryption and freedom of speech online, many of which are directly related to the ITGS syllabus. The book’s approach, being heavy on well researched examples, works well and is exactly the kind of thing I think many ITGS teachers and students would appreciate. Each chapter typically contains multiple up to date examples illustrating the issues being discussed, plus basic technical overviews where applicable. The privacy chapter, for example, explains RFID tags and how they are used. The examples are taken from many spheres of life: in the privacy chapter they range from the use of RFID tags in supermarkets, to electronic data recorders (‘black boxes’) in cars, and the UK HMRC’s notorious loss of two computer disks packed with personal data. The authors do a good job of weaving these disparate examples together in clear and easily readable language. This style also makes it easy to dip in and out of the book while still learning something. The authors recommend reading the book with an Internet connected computer nearby for further research into the examples, and I can see why. I always liked A Gift of Fire for its use of relevant and important examples, and in some ways I feel Blown to Bits is a slightly easier to read version of this. I think it is definitely something every ITGS teacher should consider using with their students. Blown to Bits is available as a hard cover version and a Kindle download, and has also the full content available as PDFs from the book’s support web site.